Now through Aug. 31, Delta Air Lines has seasonal service on Saturdays to Key West from New York’s LaGuardia Airport on Delta Connection carrier Republic Airline. Visit delta.com or call 800-221-1212. Now through Aug. 31, American Airlines offers increased service to Key West from Philadelphia and Chicago O’Hare International Airports with weekly nonstop service on Saturdays. American’s Philadelphia International Airport service is Key West’s first from that city. Visit American Airlines at aa.com or call 800-433-7300. In Key Largo, the new 200-room, 13-acre Baker’s Cay Resort (shown), at mile marker 97 bayside, is open as the Florida Keys’ only Curio Collection by Hilton. The property features pet-friendly amenities, with a Cay-9 pet program with animal beds and lifejackets, cooling water bowls and collar charms. Pets can explore the hotel’s private beach, swim in Florida Bay during Paw Happy Hour and lap up “puptails” and “yappetizers.” Pet parents can indulge at a beachside tequila and taco bar with house-made hot sauces crafted from peppers grown on the property. Visit www.bakerscayresort.com or call 305-852-5553. 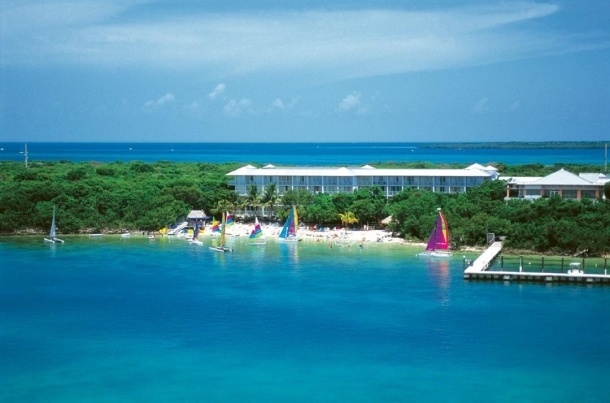 Grassy Flats Resort & Beach Club plans to open April 1 with 15 units on Grassy Key at mile market 58 in the Middle Keys. Grassy Flats Resort & Beach Club, with private verandas, full kitchens, Tiki bar and two pools, expects to be fully open with 33 total suites by summer 2020. The eco-friendly property promotes sustainability through several initiatives: a ban on single-use plastics, use of plant-based cleaning products, water catchment and cistern for landscape irrigation using reclaimed storm water and a five-year solar investment to offset resort consumption. It also added 1,500 square feet to a turtle-friendly nesting and beach restoration area. Housekeeping, landscaping and building practices are dedicated to sustainability. Visit www.grassyflats.com or call 305-998-4590. On Big Pine Key, the Florida Keys National Wildlife Refuges Nature Center is scheduled to open by early April. With 1,500 square feet of exhibition space, it showcases the Keys’ four national wildlife refuges: National Key Deer, Great White Heron, Key West and Crocodile Lake. The National Key Deer Refuge, established in 1957 to protect and preserve the diminutive Key deer and other Keys wildlife resources, celebrated its 60th anniversary in December 2017. Visit fws.gov/refuge/National_Key_Deer_Refuge/ or call 305-872-0774. The 74-foot, 41-passenger topsail Schooner WOLF, operating out of Safe Harbour Marina at 6810 Front St. on Stock Island, offers a variety of tall ship sailings that include sunset cruises, rum-running and full moon voyages set for April 19 and May 18. Conch Republic Independence Celebration sailings are offered during the 10 days of the festival. The vessel can be chartered by the hour, day or week for activities such as weddings, family gatherings and corporate or team-building events. Visit www.SchoonerWOLF.com or call 305-296-9653. In Marathon, the 64-acre Crane Point Museum & Nature Trail offers new guided daily sunset kayak and paddleboard tours by Natural Paths Paddle Adventures. Crane Point also has acquired a light-blue 900-square-foot wooden house dating back to the 1920s and a historic red railroad car that was previously located at Knight’s Key. Situated at mile marker 50.5, Crane Point includes a butterfly garden, museum, wild bird rehabilitation center, gift shop and several walking tours. Visit www.cranepoint.net or call 305-743-9100. In Key West, The Green Room eco-bar, billed as a “local hub and eco pub,” serves up unique frozen cocktails and full bar drinks “executed with environmental sustainability and efficiency.” Sales of branded merchandise, printed with eco-friendly ink, benefit Keys environmental organizations such as the Turtle Hospital and Reef Relief. The Green Room recycles glass, cardboard, plastic and cigarette butts. Most of the bar is covered in reclaimed wood from a large tropical almond tree that fell in 2014. Visit www.thegreenroomkeywest.com or call 305-741-7300. In Islamorada, the Florida Keys History & Discovery Center is to launch a new app, Walk Indian Key, in June with 12 tour stops detailing surprising history about the island, accessible by boat or kayak rentals from Robbie’s Marina. Last year, the center launched Walk Historic Islamorada. The 11-acre Indian Key is located a half-mile offshore and is deserted except for the ruins of a town that existed in the early 1800s, when residents made their living from salvaging boats running aground on local reefs. The app is being developed by the Florida Keys History and Discovery Foundation with the Florida Humanities Council and the Florida Department of State’s Division of Cultural Affairs. Visit www.keysdiscovery.com or call 305-922-2237.